Tagged under Yone Kazuki, Studio DEEN, Idea Factory, Games, Series, Drama CD, Light Novel. Chizuru Yukimura has come to Kyoto looking for her father, a doctor who has gone missing. While there, she witnesses a fight between an oni and the Shinsengumi. Taking her into custody, the Shinsengumi debate on what to do with Chizuru when they discover that she is the daughter of the doctor they are also looking for. Over all, I loved it. Sure, there were routes I slugged through and some I felt were too short, but I generally enjoyed my experience with the same. For enjoyment, I would say to any history lover and samurai lover, this is for you. You will enjoy it, even if the romance doesn't interest you. For humor, there isn't much, but when it comes, it is nice to see in an overall depressing story. As for the concept, it did a great job in being realistic with each character and the romance was one of the best I read, as each character approached the main heroine in their own unique fashions. I give it a 8.75/10, but because I am a fangirl, I mentally give it a 10/10 and tell everyone to play this game to join the growing cult. Love the historical vibe that they used in this show. It's really good and I don't see many people using it or maybe they are and I haven't seen it, idk, either way it is a short story with a slight love interest, but I like dig it. Awsome Artowk and good story - but from the beginning you feel that what they want to do - they can't achieve there goal! And Chizuru could be more useful. I mean she is an Oni she should fight more or something like that! She always needs protection. Chizuru (the female lead) was somewhat getting on my nerves (she was a bit plain for my taste), but now I'm a bit more tolerant toward her. Now that I think of it, it was almost the same with Shirou in Fate/Stay Night ... Anyway, it's a good show if you're interested in Japan's history, too! This anime use Japanaese History as the base. Some familiar Shinsengumi person like Hijikata Toshizou, Okita Souji, Saitou Hajime, Toudou Heisuke, Harada Sanosuke, etc (they all are handome here, btw^^) appear in here. The stories are about Yukimura Chizuru, a girl who is looking for his father and met with Shinsengumi men. Somehow she stayed at their headquarter while still looking. She then helped by doing the chores n befriend with them (and one of them have romantic relationship with her in the end). There is also a vampire/monster/evil (oni) liquid in the story, which can make person stronger but insane. Beside what they usually doing, the Shinsengumi men also come to take care of this problem. Some of them have die because of it. And somehow, Chizuru's father is connected with that mysterious liquid. Beside Chizuru stories, there are also stories about Ibuki Ryunosuke (Hakuoki Reimeiroku - new season). It sets before Chizuru event. Ryunosuke is a hot blooded and emotional teen who got robbed and almost die, and then rescued by Serizawa - the head commander of Shinsengumi at that time. He brought him to the headquarter and forced the teen to become his dog (slave), like gave him shoulder massages and go out to bought him sake/wine. Sometimes he also hit him. Serizawa isn't a nice-guy type. He always calls Ryunosuke by 'Inu' (Dog). Never by his real name. In that headquarter, Ryunosuke met Shinsengumi men. Some of them are so friendly, and some others are harsh. He learn about life and using sword from them, even though he hates samurai. Oh, there is also Oni-liquid in this story too. 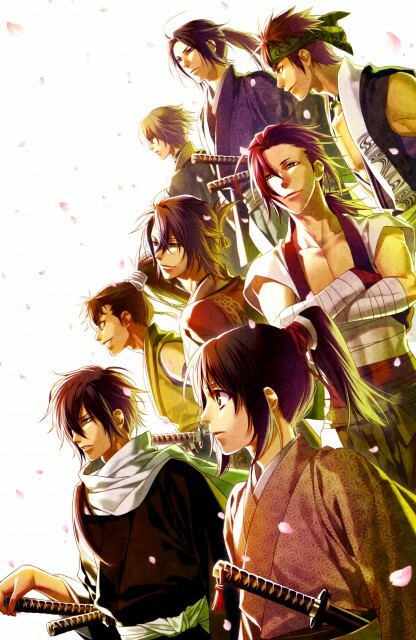 About Hakuouki Reimeiroku: the prequel good point are characters - we folloe Ibuki, who is likeable, there is strong antagonist Serizawa, an interesting character and the greatest advantage: there is no annoying Chizuru;p but the plot is still kinda slow, my, maybe because they stick with the history too much, just added the Water of Live (without it there would be no action at all).. its samurai anime so there should be blood and action, a tragedy, gosh... who needs all that dialogues and boring plot? Unfortunately, I have never played the game due to my *lack* of being able to read and/or understand Japanese. However, when the anime came out: I was happy to get a taste of what this game was like and I fell in love. Eventually, I plan on buying the art books because the artwork in this series is by far some of the most gorgeous artwork I have seen. Unlike, apparently a lot of people: I have no qualms with Chizuru. In-fact, I love her character *oh geez*. I do not see why everyone thinks a great woman character means they have to automatically equal physically strong and have a certain prowess. I tend to find that woman who posses strong character traits are woman I love more than any woman who can prove to be physically strong. It is easy to be strong of body: but is much more courageous and a testament to one's inner self to be strong of mind and spirit. Take time to appreciate the woman in animes/manga/games who do not always show their strength on the battlefield. Shinsengumi Kitan, Hekkeretsu Roku, Sekkaroku and now Reimeiroku, I've followed up the entire series. I just adore the character design and the seductive job made by the seiyuus. The historical part is pretty well glued together and it have nice twists. Buuut... Personally, I find very disturbing how they can take historical characters and sell them as a piece of meat to feed girls' fantasies (I don't imagine that with the national heroes from my homeland!). Don't get me wrong! I like how they look and enjoy drooling after a while of watching and hearing them (they're endearing characters after all), but to know that they represent important personalities for Japan's history makes me shiver. I do not know much about it and I believe that (like in every nation) people stand on different sides as for interpretations, so I can't say anything for that matter. However, I do recognize the tragic scenes where Hijikata realizes that they're just dispensable tools to politicians (a tragic truth for so many!) and when Saito shows that clothing and being lefthanded has nothing to do with honor and capability (being a lefty myself I loved this part xD). The chick's role? Oh, yeah, a total waste of space! but when we think about it,why would we(or I)hate a historical anime (actually I've learned thing about japanees history)i mean who would believe that the history would(ever)be interesting !! but it has this(tragedy ending)thing which i hate most,i mean each character i like in this anime dies or never come back(and i most of the Shinsengumi ),and i'm glad my sister weren't in the room in such moments(cuz i cried -i'm just too emotional)..
OK, this is enough for now,also remember that this is my opinion. i have been blinded by the graphics and the characters and the high quiletly colored background it really forgets me the whole story of this anime,the story is very silly ,how they did this to the real history? if they wanted to do something like this they should have made it to a fictional characters not to a real warriors i am gonna rate for only the graphics, not for the horrible story and the plot i don't know why i finish seeing all of it's episodes in the first place. The reason why I started watching it was because of... the bishounen in it XD And I wasn't disappointed. Besides, the heroine isn't annoying, as I first thought she would be (because she looks like Hinamori Momo in Bleach, bleh... --'). There's something mysterious about her that I like :) I stopped watching it because I was busy but I sure intend to watch the end of it ! From the start, the plot is interesting and the characters are intriguing... And, yeah, the design is really perfect. True to be told I haven't watched the anime version because I don't like otome games that are animated. I'm going to rate this based on my experience while playing the game since the anime is based on the game. I really like the history behind this series. You get to learn a lot of Japanese history.There were not much of romantic elements, IMO. There are other themes too, like sacrifice, loyalty and trust. Unlike SOME other shoujo animes/otome games, the main concept doesn't revolve around getting a boyfriend and such. This series gives a bittersweet vibe for me. I still suggest getting the game rather than watching it. It is rather unrealistic that every bishie in the anime will fall in love with MC. That's why I dislike harem/reverse harem when it comes to anime and manga. At least in the game, you have perfect liberty to ignore certain characters you don't like and direct your MC to your favorite one. Interesting, unique samurai story. At first, I thought it'll be a cliche, harem anime where Chizuru is in romantic entanglements and dilemmas within the Shinsengumi, but it wasn't like the game. That made me like it even more.